This paper focuses on imaging and scanning technology based on the rolling Impact Echo (IE) method. The basic background of the Impact Echo technique and its implementation with a rolling scanning transducer are discussed. A 2D imaging display using the amplitude normalization technique and typical results in time and frequency domains from case histories and a university research project are also included in the paper. Impact Echo is generally used to either determine the internal condition of the concrete structures or measure the thickness of the structures. The rolling transducer in the IE scanner expedites the IE test process by allowing for rapid, near-continuous testing. Several nondestructive testing techniques were used in a research project to locate/evaluate the grout condition inside post tensioned ducts. Then, an Impact Echo Scanner was used to scan along and across a duct for internal grout condition evaluations. Other NDT techniques such as Ultrasonic Tomography Imaging using Ultrasonic Pulse Velocity equipment and Spectral Analysis of Surface Waves were also used in the investigation. The results from Impact Echo scanning with an automatic filtering and the 2D image display produced good accuracy in locating voids in both plastic and steel ducts. Secondly, actual NDE results from post-tensioned steel ducts in a bridge are discussed. Ground Penetrating Radar (GPR) was first used to locate the ducts. Next, IE Scanning was done to locate anomalies indicative of void. Drilling and borescope examination were used to confirm voids. Also, another NDT technique using a vacuum pressure system was used in the project to measure the volume of air (void) inside the duct before the vacuum injection repair process was done. The Impact Echo Scanning test was first developed in the early 1990's by Olson Instruments, Inc. and then used as a part of the US Bureau of Reclamation concrete pipe project. This technique is based on the Impact Echo (IE) technique. The purpose of the IE test is usually to either locate delamination, honeycomb, and cracks parallel to the surface or to measure the thickness of the structures (concrete beams, concrete floors, or concrete walls). This section describes basic background of IE and its implementation with a rolling transducer for scanning. Fig 1: Schematic of Impact Echo Method. Fig 2: IE- Scanning Unit with Data Acquisition. As mentioned earlier, typical applications of IE include crack and honeycomb location, thickness measurement, and delamination detection. 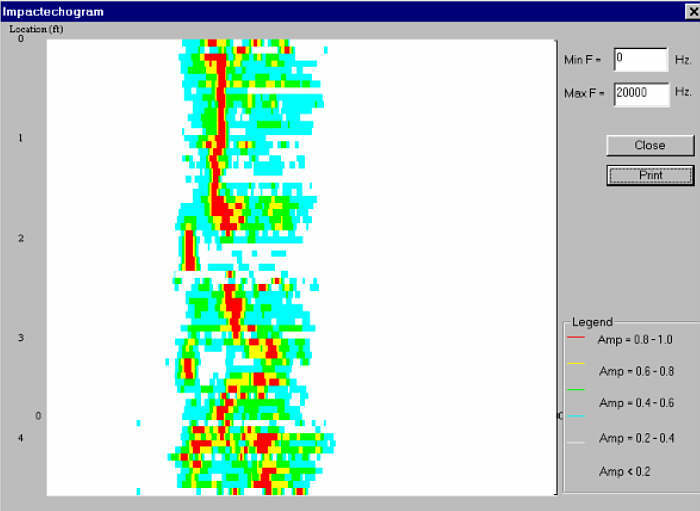 Impact Echo can also be used to identify the internal grout condition inside a post-tensioned duct in a bridge. This section discusses background of IE scanning and a case history of evaluating the internal grout condition inside a post- tensioned duct. Post-tensioned systems are widely used for infrastructure. However, one potential problem in the construction is that the duct may not be fully grouted, leaving voids in some areas. Over the long term, water could enter the tendon ducts through the voids resulting in corrosion of the tendon. Therefore, it is necessary to insure the quality of the grout fill inside the ducts after the grouting process is complete. 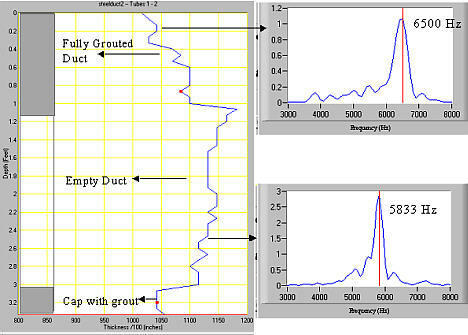 The Impact Echo Scanning test is gaining popularity in evaluating the grout condition in ducts due several reasons. First, the technique requires on only one sided access which is practical for testing ducts inside a bridge. Second, the method uses a scanning head which expedites the test process by allowing continuous testing directly along a duct. Third, the results in time and frequency domains can be processed to give a two dimensional intensity display (impactechogram), which yields more details of what is inside the ducts. As mentioned in Section 2.1, IE results are more apparent in the frequency domain. From a Finite Element model, the natural fundamental frequencies of a solid structure are different from those of structure with voids inside 1. In general, voids inside a duct shift the natural fundamental frequencies of the tested member to a lower frequency. In other words, the IE thickness results on the wall appear to be thicker in the presence of voids (due to the decreased stiffness and resonance of the wall section. 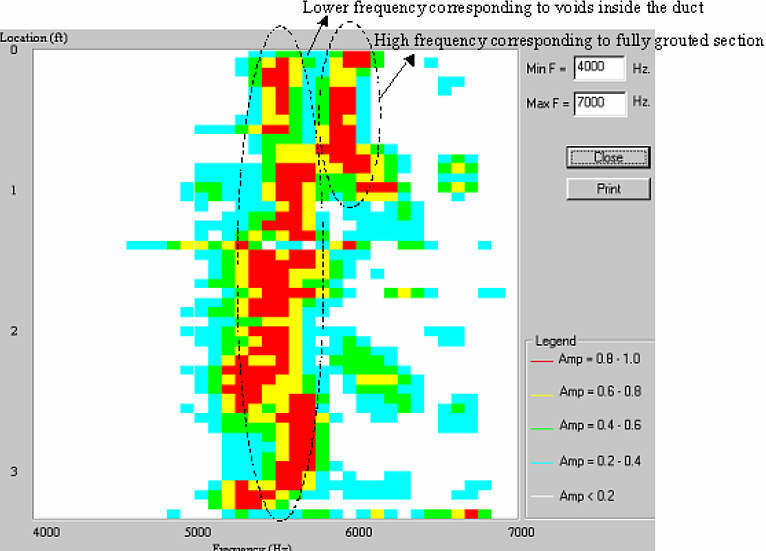 Fig 3: Thickness Results and Example Frequency Responses from the Steel Duct. A mockup wall with one plastic duct (3.5 " ID.) and one steel duct (3" ID. ), was used in this investigation. The ducts on the wall were divided into 2 sections. The bottom sections of both ducts were fully grouted and the top sections were left empty. Both ducts were filled with grout at the very top of the ducts (3 - 4 inches from the top). The wall is 3 ft wide and 4 ft high with a thickness of 9.5 inches. The first IE scan was performed along the center line of the steel duct, starting from the bottom (3" above the wall bottom) to the top (~3" below the wall top) of the wall. The thickness results and example frequency responses are shown in Fig. 3. From the frequency and thickness results in Fig. 3, it is seen that the peak frequency shifted to a lower value for the empty portion of the duct. This resulted in a higher apparent thickness result from the empty portion of the steel duct. The average thickness result from a fully grouted duct section is 9.8 inches while the average thickness result from an empty duct section is 10.8 inches. The impactechogram from the IE scanning along the steel duct is presented in Fig. 4. Fig 4: Impactechogram from IE Scanning along the Center of the Steel Duct. 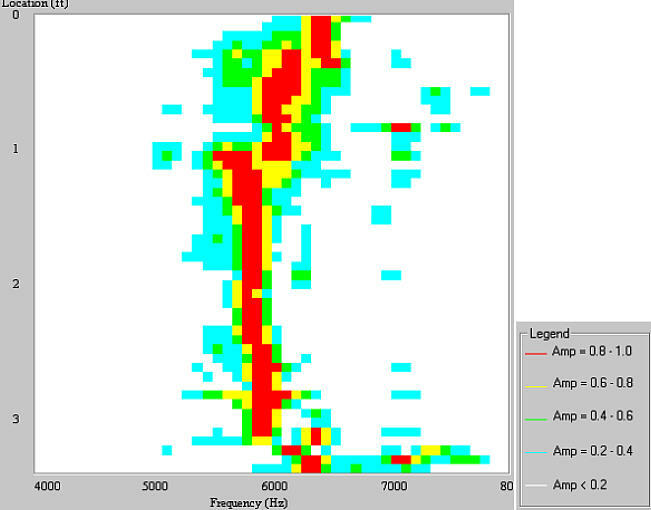 Fig 5: Thickness Results and Example Frequency Responses from the Plastic Duct. Fig 6: Impactechogram from the IE Scan along the Center of the Plastic Duct. An Impact Echo scan was then performed along the center line of the plastic duct. 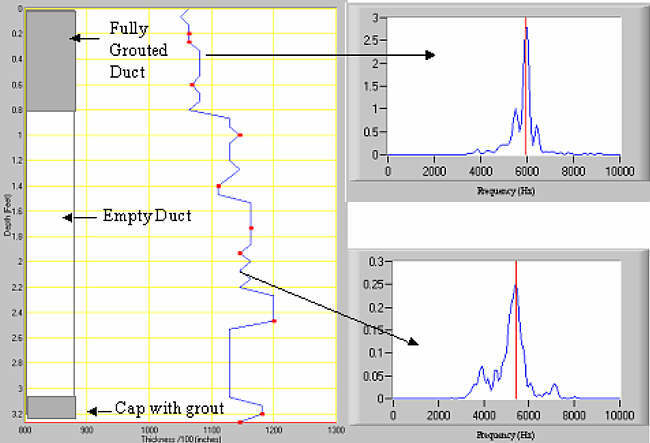 The thickness and example frequency IE results from the plastic duct are shown in Fig. 5. The average thickness reading from a fully grouted plastic duct section is 10.6 inches with an average peak frequency of 5,916 Hz. For an empty plastic duct section, the average thickness is 11.4 inch with an average peak frequency of 5,416 Hz. The impactechogram from the IE scan along the plastic duct is also shown in Fig. 6. It is noticed that for the fully grouted plastic duct section (the top section), both lower frequency peak (~ 5,400 Hz) and a higher frequency peak (~5,900 Hz) appears in the impactechogram results. This lower frequency peak corresponds to lower stiffness from plastic ducts inside the wall. However, the higher peak frequency can still be used to indicate that the plastic duct in the top section is fully grouted. Fig 7: Impactechogram from a Steel Post-Tensioned Duct (BIG-DIG Project). Impact Echo Scanning was used to locate ungrouted area in a post-tensioned cable stayed bridge. This section gives an example result from a steel duct with ungrouted sections as shown in Fig. 7. This tested duct appears to have two zones of ungrouted ducts, at 2 - 2.3 feet from the start of the scan, and at 3.2 - 3.4 feet. Apparent honeycomb/voids are present in the concrete at 3.5 to the end of the scan at 4.5 feet. The results from the research project showed that Impact Echo scanning can be used for evaluating the internal grout conditions inside plastic and steel ducts. In steel ducts, it is obvious that the downshift in the fundamental frequency indicated voids inside the duct. In plastic ducts, the downshift in the fundamental frequency is less than that of steel ducts, but also indicated voids inside the duct. However, for the fully grouted plastic duct, the impactechogram showed that both high and low fundaental frequencies appeared in the response. The low frequency indicates lower stiffness of the member from plastic ducts and the higher frequency indicated that the duct is filled. O. Abraham and P. Cote, "Impact-Echo Thickness Frequency Profiles for detection of voids in Tendon Ducts, ACI Structural Journal, May-June 2002, p.239 - 24. C. Colla and H. Wiggenhauser, "Developments if the investigation of structures with Impact-Echo technique", http://www.ndt.net/article/dgzfp01/papers/p44/p44.htm.